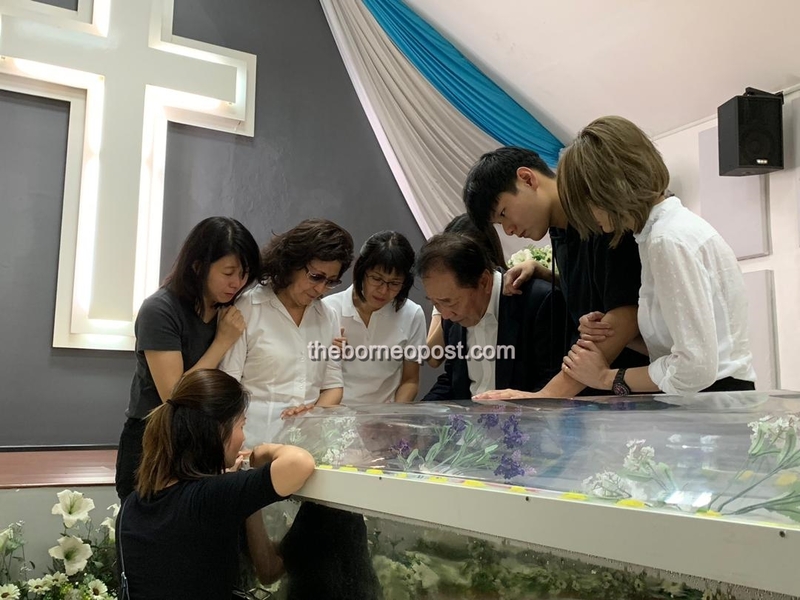 Soon Koh (third right), Leong (third left) and family members share a sombre moment together beside the casket of Andrew. 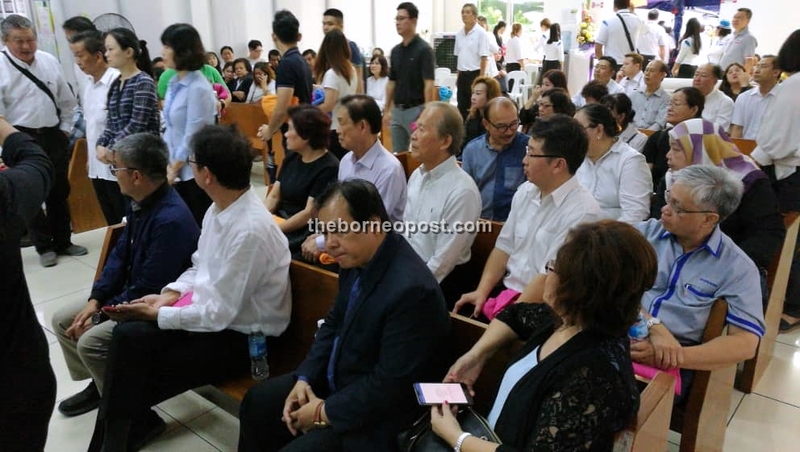 SIBU: The late Dato Andrew Wong Kee Yew’s wake at Nirvana Memorial Park at Mile 23, Oya Road here saw hundreds of people, including family and friends as well as townsfolk coming to pay their last respects to the former Sibu Municipal Council deputy chairman. Members of the public could be seen queuing up hours before the wake was scheduled to begin outside the memorial park building, with close family members and friends taking their seats inside. Andrew, aged 43, was found unconscious at around 9pm on Sunday by his mother Datin Sri Pauline Leong in his bedroom floor and immediately called for a doctor to resuscitate him. However, Andrew was pronounced dead about two hours later. 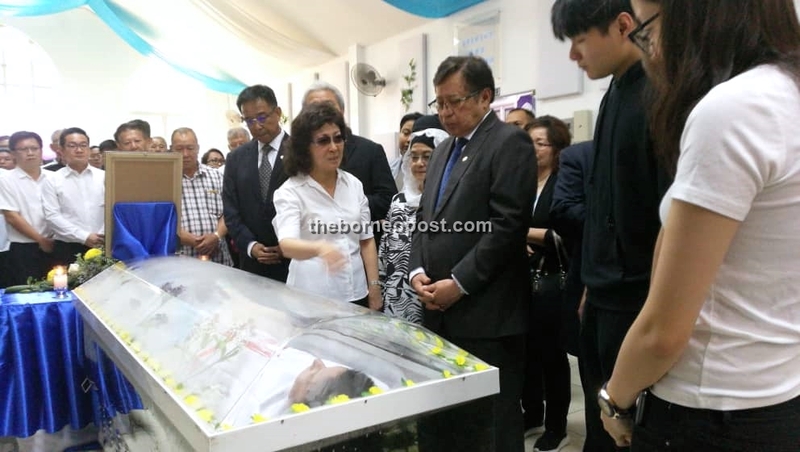 Andrew was the only son of Second Finance Minister Dato Sri Wong Soon Koh and Leong. Both parents could be seen shedding tears silently as they greeted those attending the wake. A postmortem revealed Andrew had suffered a haemorrhage on the left side of the brain and internal bleeding. 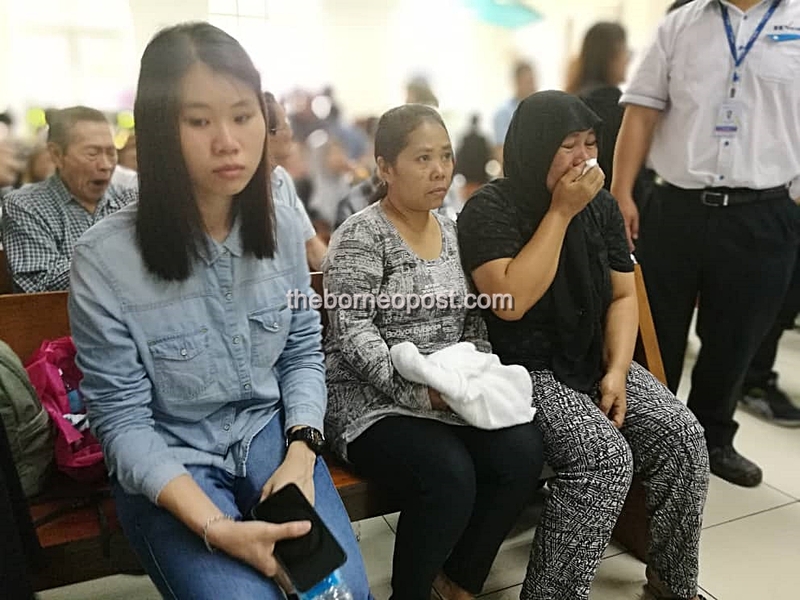 However, Sibu district police chief ACP Stanley Jonathan Ringgit said that the cause of death had yet to be ascertained as police are still waiting for further laboratory reports from Sibu Hospital. The funeral service is scheduled from 8am tomorrow (Thursday) at Nirvana Memorial Park Hall, followed by the cremation. Andrew left behind a wife Datin Lily Toh and two teenage children Sean Wong and Natasha Wong. Chief Minister Datuk Patinggi Abang Johari Tun Openg accompanied by his wife Datuk Amar Juma’ani Tuanku Bujang along with Deputy Chief Minister Awang Tengah Ali Hasan, Minister of Tourism, Arts, Culture Youth and Sports Abdul Karim Rahman Hamzah, Minister of Local Government and Housing Datuk Sim Kui Hian and other ministers and dignitaries also visited the wake to pay their last respects. Head of State Tun Pehin Sri Abdul Taib Mahmud is also expected to attend later this afternoon. Soon Koh (fourth left) and Pauline (fifth left) hold back tears as they pay their last respects at the wake. 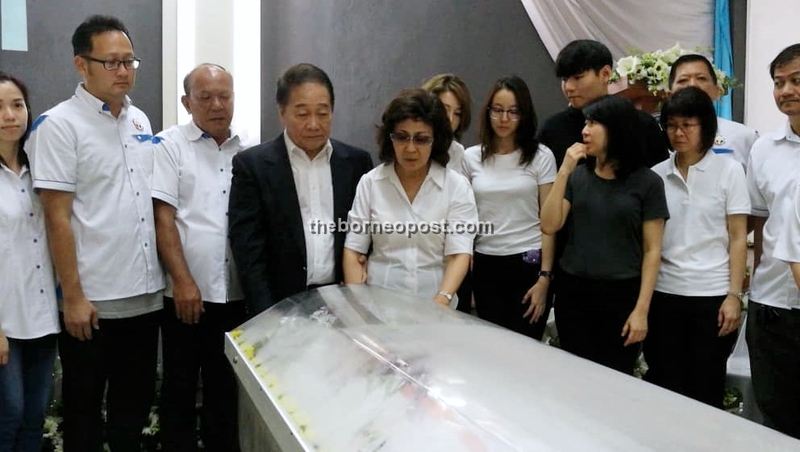 Abang Johari (third right) pays his last respects at the wake. Hundreds queue up to pay their last respects to Andrew. Soon Koh’s maids Boni (right) and Aishah (centre) loved Andrew, according to Leong.